In 2005, Bates celebrated its 150th anniversary. A schoolchild can do the subtraction and arrive at the founding year: 1855. But here’s where the math takes a twist. Founded as the Maine State Seminary in 1855, Bates became a college in 1864 when the Maine Legislature changed its charter. When Bates celebrated its 100th anniversary, the various centennial events took place not in 1955 but in 1964. Subtract 100 from that year and you get a different founding date: 1864. Why two different founding dates, 1855 and 1864? First a chronology; then an explanation. 1855: A new preparatory school, the Maine State Seminary — later to become Bates College — receives its charter from the Maine Legislature on March 16. The new corporation holds its first meeting, in Augusta, on April 5. 1856: The laying of Hathorn Hall’s cornerstone takes place on June 26, 1856. 1857: The new “fitting school” opens its doors on Sept. 1 with 115 students and six teachers. Enrollment totals 137 by term’s end. 1861: Fifteen students petition for college instruction. Later, in 1862, another group of students, “some with tears in their eyes,” according to The Life-Story of O.B. Cheney, comes before the Trustees to lobby for a college course. 1863: The seminary offers college instruction to 22 students. Eight go on to become, in 1867, the first graduating class of Bates College. 1864: The Maine Legislature changes the school’s name from “President and Trustees of Maine State Seminary” to “President and Trustees of Bates College.” The new name honors philanthropist Benjamin Bates. While other scoff at the idea, Bates encourages Cheney to transform the seminary into a college. 1867: Bates College holds its first Commencement on July 31, 1867. The first graduating class numbers seven men. 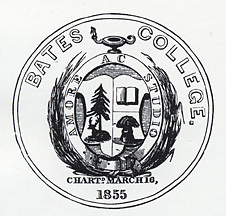 Bates College seal, circa 1864. 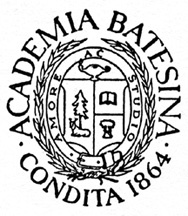 Consistent with our peers, Bates now recognizes its founding year as the year of its initial charter, in this case 1855. In fact, the earliest college seal reflect the 1855 charter date. 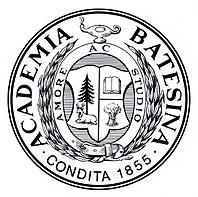 At left is how the Bates seal appeared in the Laws of Bates College, With the Legislative Acts Having Relation to the Institution, printed in 1864. But in the 1870s, Oren Cheney himself began to use the 1864 date as the starting point for Bates, though he seemed to know he was deviating from accepted thinking. Maybe Cheney was distancing the college from the seminary — perhaps an early example of branding. By the early 20th century, three dates sometimes appeared on different college seals. In Mirrors between 1918 and 1930, some seals read “condita [founded] 1863,” others read “condita 1864” and others “chart. March 16, 1855.” During the later 1900s, the 1864 date won out (and was the year used for centennial purposes in 1964). The college seal as it looked through the mid-1900s, with 1864 as the founding date. Then along came Hedley Reynolds, the college’s fifth president. A historian, Reynolds was puzzled by the 1864 date, so much so that around he asked the Trustees to revert to the 1855 date. They did, and in the early 1990s, a campus committee worked with noted graphic designer Malcolm Grear to update the seal’s design, from the oval depiction (right) to a round version (below), more in keeping with the original seal from the college’s earliest days. “Like all colleges I know of, Bates takes its proper founding date from the founding of the corporation, regardless of later changes in name or modifications of purpose,” Reynolds wrote in reply to a letter in Bates Magazine in 1988. After Reynolds’ request to the Trustees, college publications slowly reflect the change. In the alumni magazine’s photo coverage of 1982 Commencement and Reunion, for example, both dates can be seen in photos where the college seal is visible. One photo, showing a giant seal hanging at the Alumni Award Ceremony, carries the 1864 date. Another photo, of the traditional 50th Reunion “Golden Jubilee” banner, carries the 1855 date. How, you ask, could an old banner carry the new date? The banner was in rough shape by 1982, so the Alumni Office had it restored with a newly embroidered seal, and someone was forward-thinking enough to use the 1855 date.